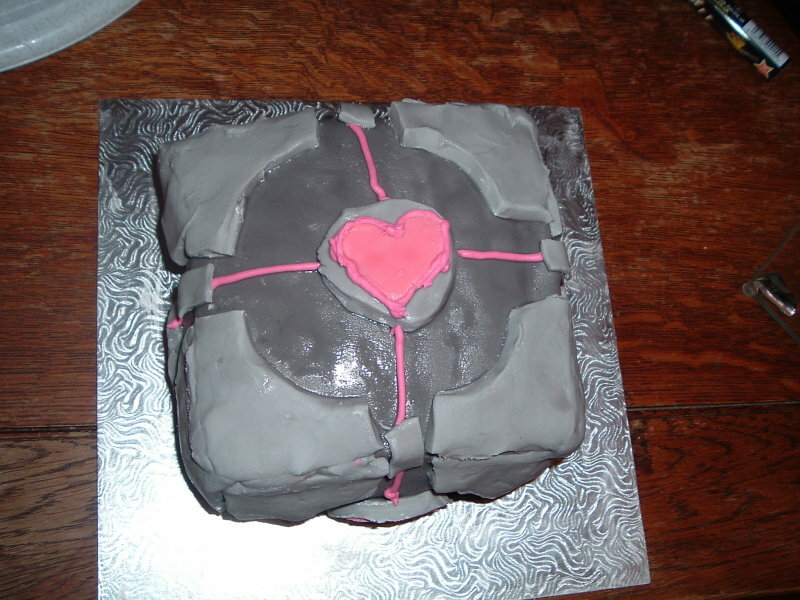 Ever since Portal came out in Mid October 2007, my husband Ben has been more or less obsessed with Moist Delicious Cake and The Weighted Companion Cube which are both "components" of the game. His Weighted Companion Cube Plushie arrived just before Christmas and he fell in love with it. I decided to make him a cake for his birthday on Friday (4th January). I'd been toying with the idea since the game had first come out in October, but with the arrival of the plushie version I had a 3D model I could copy. Today me and my friend Rah got down to work and spent the day making a Weighted Companion Cube Cake. First we went shopping for the necessary articles with which to make cake. No mean feat, given today was new years' day and only Sainsbury's was open (Morrisons and Asda being shut) and even Sainsbury's had very little in the way of what we needed. Luckily we just got more expensive stuff and managed to get everything we wanted. We chose to be masochists and mixed the cake by hand, then cooked it in Rah's rectangular Lasagne dish as we felt it was a suitable size. While the first cake was cooling we made the second cake. As the second cake was cooling we began to construct the cube. First we cut the first cake in half and stuck the halves together with Jam (strawberry, but you could use any that took your fancy). We used the second cake to continue the construction, also cutting it in half and sticking all the bits together with strawberry jam. 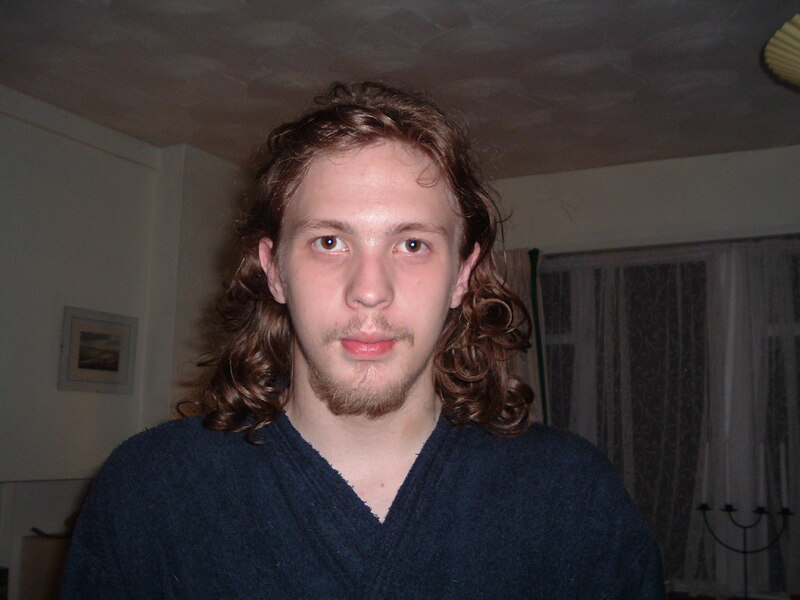 Then we trimmed the sides to a greater or lesser extent to make a cube shape of what was left. While various parts were cooking and cooling we made templates from cardboard to cut into the icing around so we had the right shapes to decorate the cube with. The templates with the plushie version which we were copying. Next came the really messy bit - making the icing! We used a large box of ready to roll royal icing and icing sugar to act as "flour" and stop the icing from sticking to the work surface. We added black food colouring sparingly to make varying shades of grey and some pink food colouring to make the hearts. These got covered in white icing sugar in the process of colouring and rolling it out, but a pastry brush and water took care of that and restored them to the colours they were supposed to be. To use the templates, just lay them out on top of the icing on your worktop and use a sharp knife to cut around them (much as you would with a pastry cutter). The thin lines of pink were writing icing. The hardest bit was getting the bottom layer of icing the right shade of grey and long and wide enough to cover the entire cube. Then we used water on a pastry brush to stick the pieces of icing which had been cut from the templates onto the bottom layer. The consistency when wet was something like wet clay. Eventually it was done, but wet so we left it to dry while we cleared up the terrifying mess we had created. Finished Weighted Companion Cube Cake from another angle. 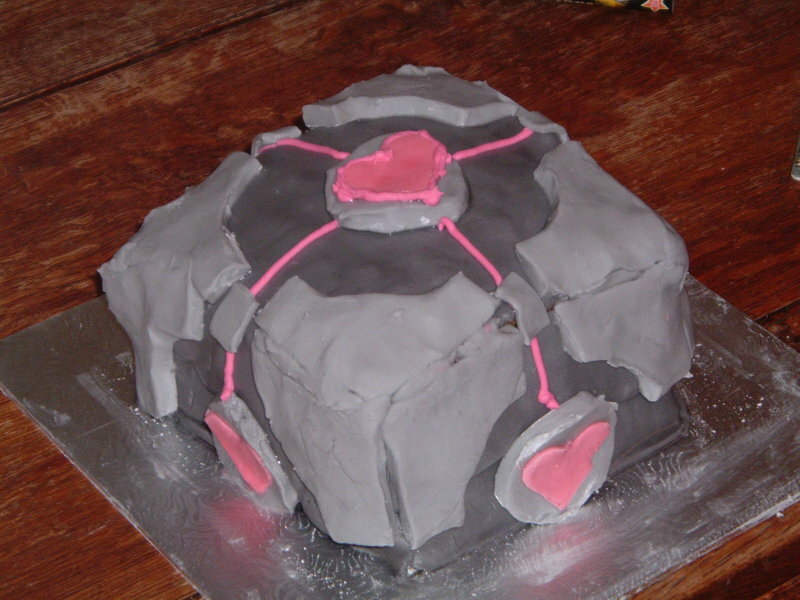 If you want to submit pictures of your Companion Cube cakes and have them put up on this page (along with a link I can attribute them to) then please feel free - I'll stick up some sort of gallery if anyone does. If you've any suggestions to make or links you would like added to this how-to then please email me.